Cross halving joints are probably the most simple of joints to mark out and cut. They are used whenever it is necessary to join two pieces of wood that cross over each other. Sometimes these joints can be seen on the strengthening rails of tables and chairs. The animation below is a good example of ‘Halved Joint’. In this type of joint one piece crosses over the other part. If you look closely you can easily see that a part of each piece of wood has been cut away so that they both fit together when they are finally glued together. Notice there are different names for each halving joint. 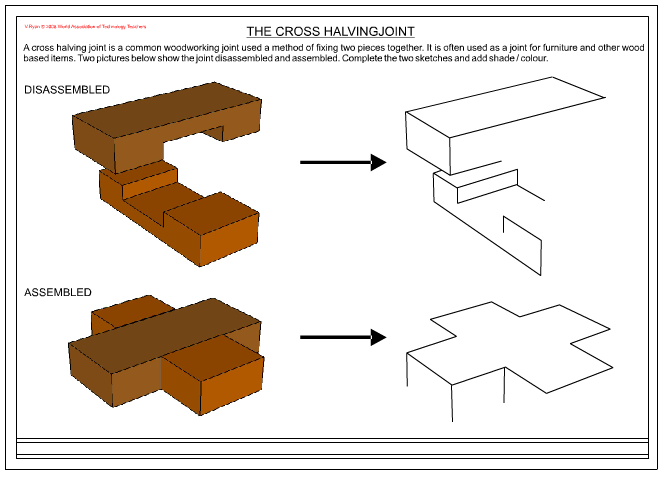 A cross halving joint is a common woodworking joint used a method of fixing two pieces together. It is often used as a joint for furniture and other wood based items. Two pictures below show the joint disassembled and assembled. Complete the two sketches and add shade / colour. 1. Draw a simple diagram of a table or chair and show how across halving joint can be used to join the strengthening rails.